I'm at my sister's house right now and I bought my stack of movies with me. 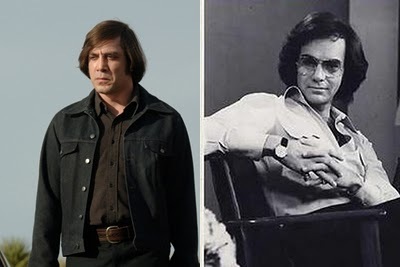 Last night we watched "No Country For Old Men." Before we watched it, I said to my sister, "There's something about this movie that makes people really angry. I don't know what it is, but whenever I hear people talk about it, they get really worked up." Well, having watched it, I now know what makes people so angry. But I'm not telling you! You'll have to see it for yourself to find out. I will say, though, that the movie was great, filled with suspense. 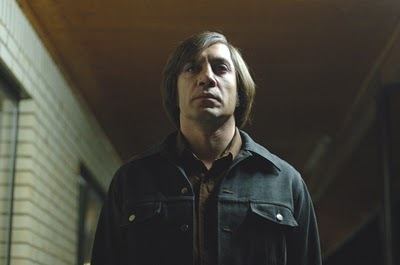 And that Javier Bardem is the creepiest mf-er you'll ever see on the big screen. Even with his bad hair. My sister was like, "Is it just me, or does he look like Neil Diamond?"